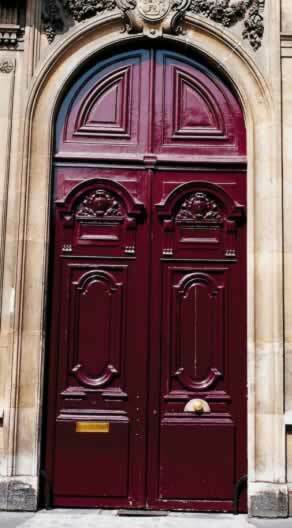 While this mahogany door is a traditional, six-panel double door, there's nothing ordinary about it. While the kick panels at the bottom are spacious and plain, the central panels carry raised frames and the upper-third panels are decorated with rich Continental touches. Above the transom, double panel trims and optional keystones complete the motif. Polished brass or copper kick plates, mail slots, knobs, and other hardware always enhance the formal motif. Brought to the American colonies from the Caribbean, mahogany exhibits a naturally reddish tint, often accentuated by dark stains. Eighteenth Century conquistadores harvested mahogany from the Bay of Campeche, above what is now called Mexico's Yucatan Peninsula, for shipment to Europe where it was put to use in religious, military, and governmental architecture.